Crude barrels are following global markets into the downside as major stock indices tanked during Tuesday's session. US oil prices slipped from a near-term high of 54.40 all the way back to the $52 area. Investors are once again concerned about economic slowdown throughout the broader major economies after US President Trump tweeted that he would be placing "major tariffs" on China if they didn't cut him an acceptable trade deal in the months to come. 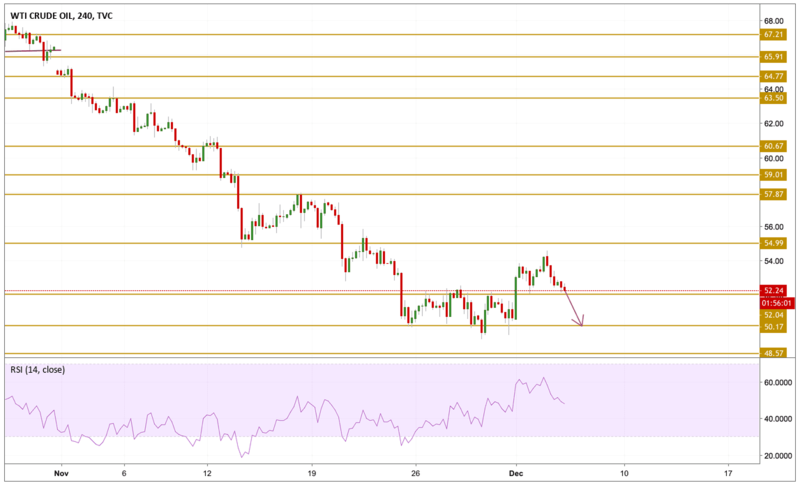 The oil recovery ended as prices hit the key resistance level at 54.5 level triggering a sell-off as prices dropped all the way back to retest the $52 support level. The momentum has been slowing down and currently in decline as we can see on the chart but still not entirely bearish. Selling could accelerate if the $52.24 level is crossed and the next key technical support line we will be focusing on is the $50.17 level.